Google Maps announced a new feature which allows users to move location markers that point to a specific address to a more accurate location so that they reflect the exact location of the address. In order to move the location markers users should sing in to Google account. 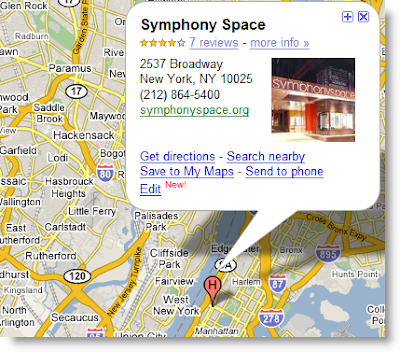 A Google Maps Software Engineer wrote in a blog post "If it's in the wrong place, just move it to the right one"
Now lets us see try how to move a move location of Symphony Theater located in New York City. 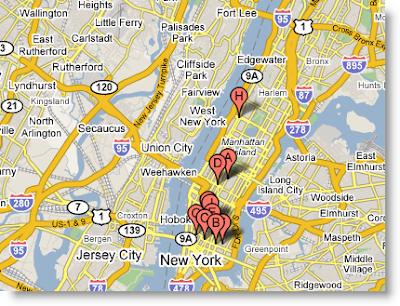 Go to http://maps.google.com and search for Theaters, New York; the search resulted the following theaters location markers on the map. The marker H shows the location of Symphony Theater. Click on the marker; a small pop up window with edit option appears on the screen. Click on Edit and then select Move Marker option in the same popup window. 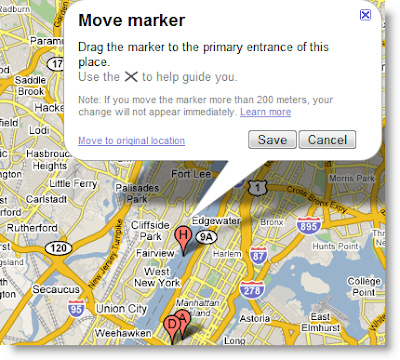 Now you can move the location marker by clicking on it and dragging to the desired location. After moving to the desired location click on Save to save the changes. Just for fun I move the theater location to middle of river next to it and canceled the operation with out saving. Even though it is possible to move a marker to any location on the map, change will be reviewed by moderators and edited entries will have the option to "show original" link. As Google is tracking the change of location markers of every user through the Google Id, users are not expected to move the markers to invalid locations. Looks like this option is available on maps of selected countries like US, UK and etc. I tried to move the address locations of major Indian cities but could not do that as there is no option like Edit.